These crude but vividly carved light wood molds were used in shaping Purim cakes popular in the Pale of Settlement. 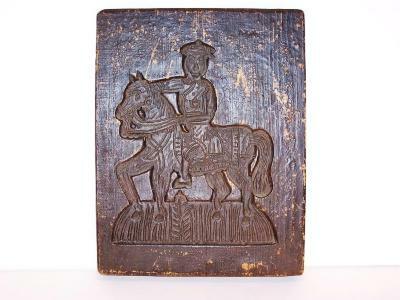 This mold depicts a hand-carved figure of Mordecai with typical Polish cap, riding on a royally dressed horse. Mordecai has a recognizable Star of David on his vest. Used as a mold for baking.